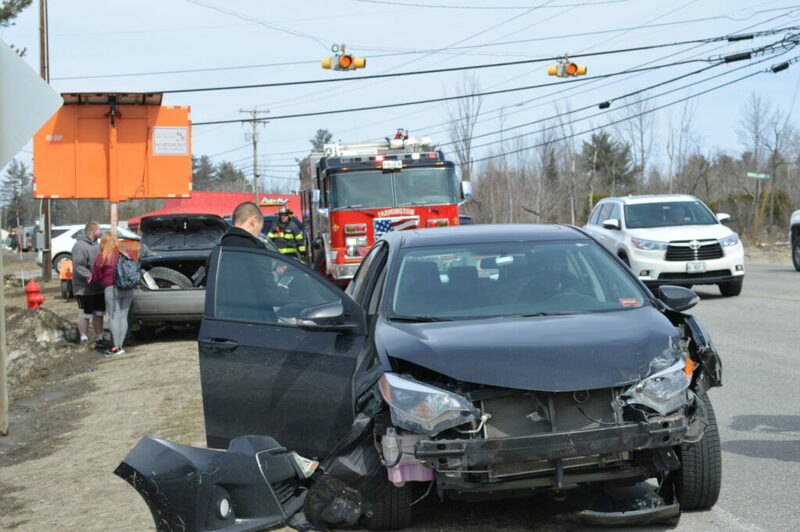 A car failed to yield the right of way Thursday as it pulled out of Knowlton Corner Road in Farmington and was rear-ended by another vehicle, police said. FARMINGTON — A car driven by a local man who didn’t have a license pulled out of Knowlton Corner Road on Thursday to take a left onto Routes 2 and 4 and drove into the path of another car traveling on the highway. A 2007 Ford Focus driven by Austin Seeley, 20, of Farmington, which failed to yield the right of way, was rear-ended by a 2016 Toyota Corolla driven by Aaron Wallof, 29, Scarborough, officer Jesse Clement said. No one was injured, but a passenger in Seeley’s car, Kiara Austin, 17, of Chesterville was checked out as a precaution by NorthStar EMS ambulance personnel, he said. Seeley who was driving with a learner’s permit with no licensed driver in the car was arrested on a misdemeanor charge of operating without a license, Clement said. Officer Darin Gilbert took Seeley to the Franklin County Detention Center. His bail was set at $250 cash, a corrections officer said. Both vehicles were towed from the scene. A conviction on the driving charge carries a maximum penalty of six months in jail and a $1,000 fine.